8 New Kids Added This Week! Sadie is a sweet little girl from China that just turned 3 years old. Sadie has CHD (ASD) but it doesn’t need to be treated at this time. She also had a mass removed from her abdominal area back in 2014 that was said to be a neuroblastoma (differentiated, improved). Sadie appears to not have had any issues with developing new neuroblastoma’s since that time and seems to have generally normal health at this time. Sadie is described as being a clever & lovely girl and she is very popular with the caregivers and other children in the orphanage. Sadie knows all of the names of the caregivers and other children she knows in the orphanage. She can walk stably on her own and go up and down stairs successfully. She can use spoons to feed herself and she has a very good appetite. It sounds like Sadie is potty trained. Sadie can follow simple instructions and knows how to keep her area tidy by putting her dirty clothes in the hamper or putting her dishes away at meal times. Sadie is very smart and she is able to learn new information quickly. Sadie can speak 3-5 word sentences, she asks “how” and “what” questions and she understands how to express her needs using her words. Sadie enjoys listening to music, singling and playing with other children. 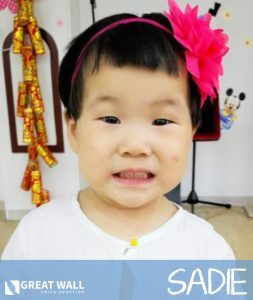 If you would like to learn more about how you can adopt little Sadie, please contact the Great Wall China Home Finding Team by asking to review this child’s file today! Click Here to Watch one of Sadie’s NEW Videos! Levi is a precious baby boy that is almost one and a half years old. Levi can walk by himself now and is very curious. He has good fine motor skills and is learning how to pick up very little objects with his forefinger and thumb. If he drops something on the ground he will go look for it and pick it back up. Levi is babbling and starting to imitate words. He likes to listen to music and play with toys like balls and building blocks. Levi gets along well with others and is close with his caretakers. Levi likes to get hugs from his caregivers. 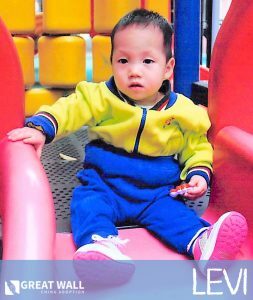 Levi has been diagnosed with Thalassemia type A which is the less significant form of Thalassemia. Levi has never needed to have a blood transfusion because of how well he is doing. 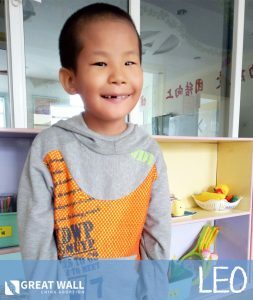 If you would like to know more about how you can adopt Levi, please contact the GWCA China Home Finding Team by requesting this child’s file or by calling us at #512.323.9595. Click Here to Watch one of Levi’s NEW Videos! You can watch more NEW videos of Levi when you request to review his file! Wyatt is an amazing 9-year old boy in need of a forever home! Wyatt’s appears to have some issues related to his kidneys, and his file also indicates that he may have a mild form of spina bifida. He does not appear to have any issues in regards to his mobility or overall development! 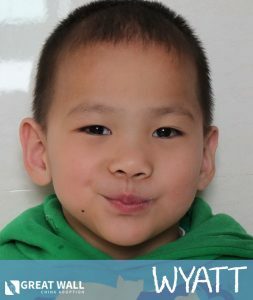 Wyatt is a bright kiddo who loves to perform and imitate songs and dances he learns on TV! He is a great help to his teachers and caregivers and loves to help care for the small kiddos in his orphanage. His caregivers love him very much and hope that he can find a home soon. Please reach out to Great Wall to learn more! Henry is a sweet little boy that is 3 and a half years old. Henry has a post-operative heart condition (VSD) and he appears to be doing well! One of Henry’s eyelids is a little droopy, but he can see clearly out of both eyes and has normal vision. Henry can walk and can go up and down stairs by himself. He can follow simple instructions as given by his caretakers. He knows how to express his needs, such as when he wants to eat. His care takers say that he is a very curious little boy. Henry likes to dance and color! 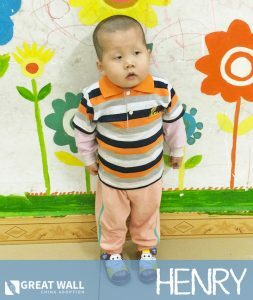 You can contact the Great Wall China Adoption Home Finding Team if you would like to learn more about adopting Henry! Click Here to Watch one of Henry’s Videos! Meet Isabel! Isabel is a precious 6-year old girl in need of a family to call her own. Isabel has been diagnosed with cerebral palsy, with secondary epilepsy as part of her overall diagnosis. She also appears to have cerebral dysplasia and hexadactyly of the left foot . Isabel also appears to have started puberty early, although it is unclear from her file if doctors know the reason at this time. 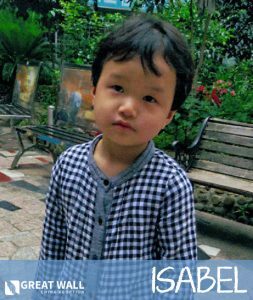 Great Wall has reached out to Isabel’s orphanage and is hoping to learn more about her needs and personality! Isabel takes classes on Monday through Friday, and she appears to be very close with her teachers and caregivers. She imitates adults well and is an active and happy kiddo. She loves to watch cartoons and play with toys with the other kiddos! Isabel is a sweet girl who would thrive with the consistent care of a forever family. Please reach out to Great Wall to learn more! Oliver is an amazing 12-year old boy in need of a forever home! 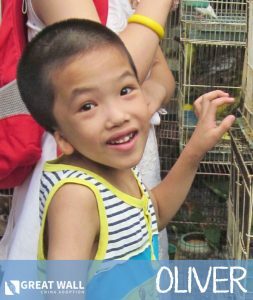 Oliver has atresia of his right ear, as well as a condition called torticollis in which his head and neck tilt slightly to one side. He is an extremely smart kiddo who is doing great in school! He loves to play with toy guns and cars, and in particular likes to take them apart and re-assemble them. He is a bright and creative boy who loves to challenge himself! In 2007 he was sent to live with a foster family, and he has thrived under their care. His foster family says that his arrival has brought them much joy and happiness! He has incredible self-care ability and does not appear to have any mobility delays whatsoever. He says hello to his teachers in English and loves to sing with the other children in his class. He loves to tell his foster parents what happened in class that day and appears to be very communicative overall. Sometimes strangers will have trouble understanding what he is saying, but his teachers, caregivers, and friends do not appear to have any issue. He loves to paint and will often paint right after school before beginning his homework. He is an amazing and smart child who would thrive with the love of a forever family. Please reach out to Great Wall to learn more! **GWCA Staff Member Met Quinn! ** Quinn is an adorable little girl from China that is 3 and a half years old! Quinn has Down’s Syndrome and is doing quite well. One of our GWCA staff members met Quinn when she visited China last year and she would be happy to speak with any interested family about Quinn! Quinn has been described by caregivers as clever, introverted, cute and energetic. Quinn lives in an imitation family on the orphanage grounds, which is like a foster family, so she is receiving more one-on-one attention than some other children. Quinn can use her hands to hold small objects, such as sticks, books, spoons, etc. Quinn can pass toys between both of her hands and can use hands to support herself. When Quinn is sitting up the child has good balance and can change her position freely. Quinn can crawl, she can stand up by herself and is learning to walk. Quinn likes to walk around using small chairs and stools to help her balance. Like many children with Down’s Syndrome, Quinn’s language abilities are delayed compared to other children her age without Down’s Syndrome. However, Quinn can say words like “ma ma,” “ba ba,” and she imitates what adults and children around her are saying. Quinn enjoys listening to music, looking at picture books and dancing. Quinn can color on paper and play with puzzles. Quinn is clearly a very curious little girl and always seems to want to figure out how things work. 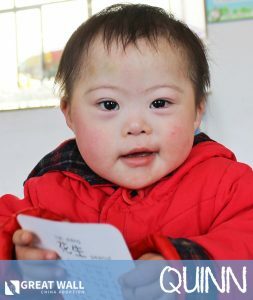 You can contact the China Home Finding Team at Great Wall if you would like to learn more about adopting Quinn. We hope we are able to find Quinn her Forever Family soon! Click Here to Watch one of Quinn’s NEWEST Videos! There are several more videos of Quinn, so if you would like to watch them you can just request to review her full file today! David is a sweet little boy from China that is 6 and a half years old. David is deaf so he some developmental delays compared with his hearing peers. David lives in a rural area of China, so his ability to learn sign language currently is very limited, so he isn’t really able to communicate well with others. One of our GWCA staff members met David when she visited China earlier this year and she would be happy to speak with any interested family about David. Even though David can’t communicate all of his thoughts and feelings with others, David has a good attitude and a happy nature. David is shy but he does get along well with others. David’s caretakers say that he has good self-care abilities like being able to go to the bathroom by himself and putting on his clothes by himself. David does not currently go to school, but when he is older they hope they will able to get him some schooling to learn sign language. What David really needs though is the love and care of a Forever Family and the educational resources to thrive as a deaf individual. David will most likely never receive what he needs to grow up and become an independent person without being adopted by a family in the United States. 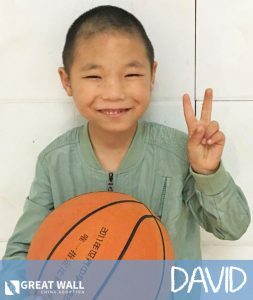 You can contact the China Home Finding Team at Great Wall if you would like to learn more about adopting David. We hope we are able to find David his Forever Family soon! Click Here to Watch David’s NEW Video!